The story revolves around disappearance of a star volley ball player of a school and goes on to show the effect of this disappearance on every individual in that school. 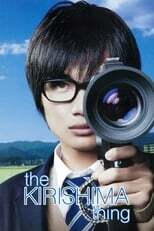 The Kirishima Thing is directed by Daihachi Yoshida and was released on Aug 11th, 2012. Director Daihachi Yoshida's Drama movie The Kirishima Thing is produced by Nippon Television Network Corporation (NTV) & was released 2012-08-11.